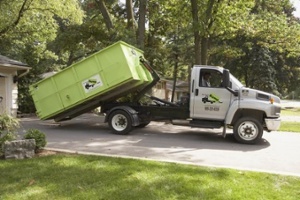 https://houston.bintheredumpthatusa.com/dumpster-rental-katy	Bin There Dump That Houston	https://houston.bintheredumpthatusa.com/img/franchisees/54.png	20730 Highland Hollow Lane,, Humble, TX	Contact us for more details. Discover how we make renting a dumpster in Katy, TX a simple and easy process. Bin There Dump That is committed to making the dumpster rental process for the customer a seamless transaction, from placing an order for the needed dumpster size to delivery of the waste container in Katy to an immediate pick up when you no longer need the bin on your driveway. Wading through the miles of impossibly tall grass, the fur trapper is on the hunt for any critters that get stuck in this green maze. Katy, once known as Cane Island because of the tall grass that grows around the creek has come along way since it’s fur trapping days. Katy residents no longer have to worry about muddy soil keeping new residents away. Katy is a fast-growing suburb of Houston with tons to do. But the last thing you want to spend a Saturday doing is driving to the dump. As the best dumpster rental company in Katy, we always take your haul to the dump for you. And we care about your property as much as you do, so don’t work with dumpster rental services that don’t protect your driveway. Texas summers can be brutal. With temperatures regularly reaching over 100°F, the summers will have you running to the Typhoon Texas Waterpark. Located in nearby Houston, the state of the art waterpark offers steep slides, slide boarding, and a lazy river. Your kids might be the ones that drag you to the park, but you’ll be the one begging to stay in the lazy river by the end of the day. Visitors are often pleasantly surprised by Mary Jo Peckham Park. The lake is stocked full of fish year round and there are multiple playgrounds and trails to keep the kids busy. Family outings can get expensive fast, but Mary Jo Park is always free. Even the put-put golf course is open to the public free of charge. The Railroad Museum is housed in a real restored railroad depot. Outside there is an authentic red caboose to check out as well as a small grassy park for the kids to play on. Katy was the perfect place to stop for trains to fuel up and get more water. Explore Katy’s history as a popular railroad stop over your next weekend. Your local Dumpster Rental Katy dumpster rental operators are Ivan & Michelle And Tony & Sylvia.